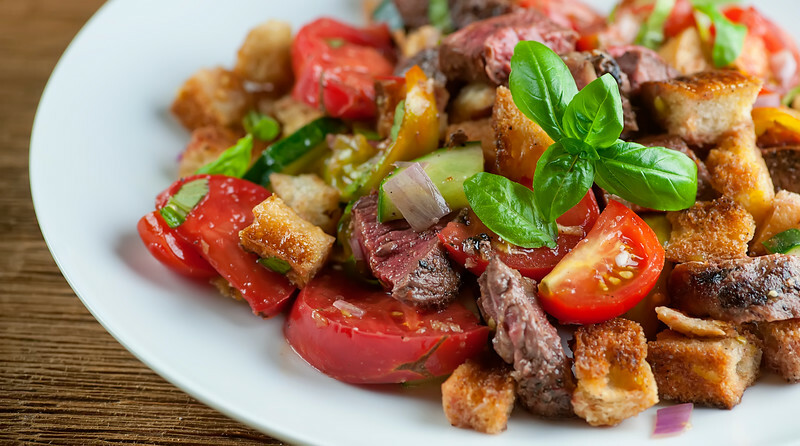 This recipe for steak panzanella salad is a glorious and easy combo of steak, tomatoes, bread and basil…the perfect summer dinner. Take advantage of those sweet summer tomatoes and glorious basil while it is still local and fresh! This recipe for steak panzanella salad is currently on heavy rotation in my kitchen, because in case you hadn’t noticed we are on the other side of August, and you know what that means. It is officially use-it-or-lose-it time when it comes to things like sweet, glorious local tomatoes and intoxicating basil. Sob. And so I am pretty much working tomatoes and basil into breakfast, lunch and dinner, with a break here and there for local corn, and this hearty salad is one of my favorite ways to do that. Juicy chunks of grilled steak, lightly toasted pieces of bread tossed with cucumber and a light oil and vinegar sauce along with (say it with me now) tomatoes and basil. Let’s make it!You can use whatever your favorite cut of steak is for this one – I’ve used everything from flank steak to filet – but this time we had a nice strip steak in the fridge, so the Souther husband took it out to the grill and cooked it to a gorgeous medium rare. Meantime I cut up a baguette into bite-sized pieces, tossed them with olive oil and salt and pepper and toasted them on a cookie sheet until they were just golden. I snacked on a few for, you know, quality control purposes. After that it was just a matter of slicing up the tomatoes along with some red onion for sass and a little cucumber, and then tossing the whole thing with a quick mixture of red wine vinegar and olive oil. I like to let the salad sit for about 15 minutes or so before I dish it out, just to let the bread absorb a little of the dressing and the steak and tomato drippings. Which is basically torture, but it’s worth it. And there you have it – the dreamy, delicious end of summer, right there on your plate. 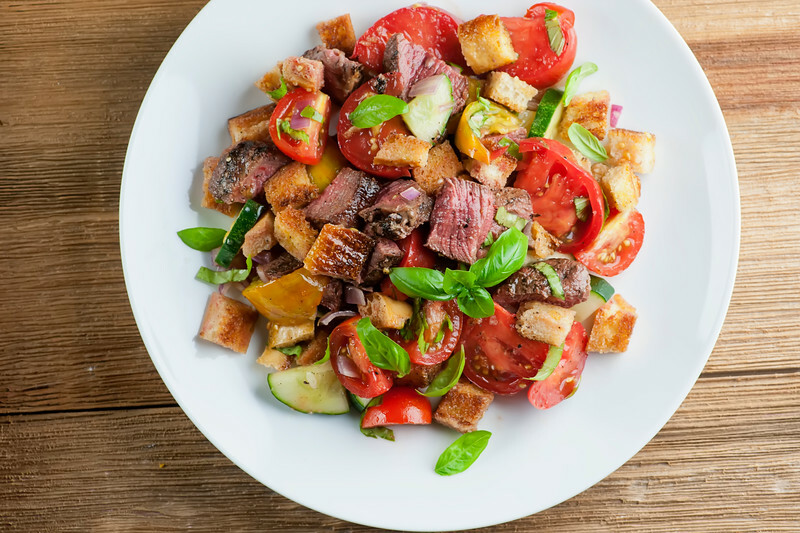 This recipe for steak panzanella salad is a glorious and easy combo of steak, tomatoes, bread and basil. The perfect summer dinner! Heat grill to high and cook steak to your liking – about 3 minutes per side for medium rare. Let the steak rest under foil while you prepare the remaining ingredients. Toss bread cubes with 1 tablespoon olive oil and a pinch each of salt and pepper. Place on prepared baking sheet and toast in the oven until golden, 5 to 10 minutes. Slice steak into bite sized cubes and add to large bowl. Add bread cubes, tomato, cucumber and onion. Shake remaining oil and vinegar together in a small jar with a pinch of salt and pepper. Pour over salad and toss. Add basil and toss again. Let the salad sit for about 15 minutes so the flavors can combine and then serve. This is my kind of salad Kate! I’m a meat and tomatoes girl at heart! Will be sad to see those Jersey tomatoes go! Boo hoo! 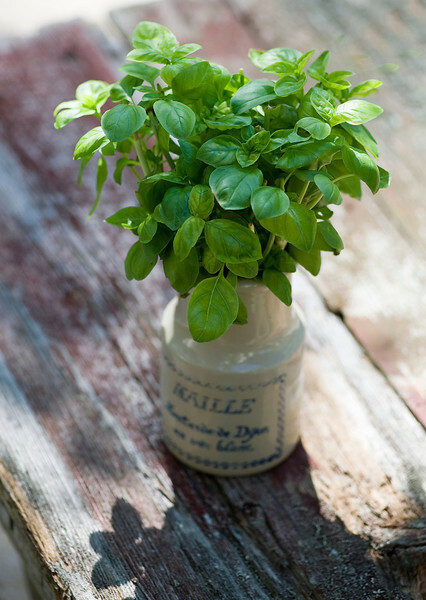 I am going to really miss all of this fresh basil in about four months. Have to use it while we can! This looks scrumptious! Oh I love your version of panzanella, Kate! I’ve never had it with steak before, so I have a feeling my husband would devour this in about two seconds! Looks so perfect for a weekend meal! the basil in this basically seals the deal for me! Kate, I swear to the powers above that if we lived remotely near each other, I would pay you to make me dinners and bring them over. I do not have a handle on dinner now that my work hours are crazier, and I look at the plate on the screen and just feel longing.